Babu Jagjivan Ram was one of the brightest stars of the Indian political horizon. By dint of his excellent qualities of head & heart, he carried all the assignments with distinction as political leader, parliamentarian, social reformer, administrator, Indian Union Minister, Labour & Dalit leader. The upsurge in East Pakistan against the West Pakistan suppression resulted in great influx of refugees to India, which in turn became main cause of Bangla Desh liberation war. As then Defense Minister of Indian Union, Babu Jagjivan Ram was the main architect to win 1971 Bangla Desh War resulting in carving out Independent Sovereign Bangladesh from Pakistan, formerly called as East Pakistan. This was perhaps the only war in Indian History of many centuries when India captured alive over 90,000 enemy soldiers including highest ranking commanders and successfully defaced the enemy country. He was not cowed down by the presence of American’s 7th fleet of war ships in the area for strategic support to Pakistan. Although his chances of becoming Prime minister Of Indian Union were blocked four times yet he did not loose heart and continued to serve his mother land including the disadvantaged poor and downtrodden peoples. 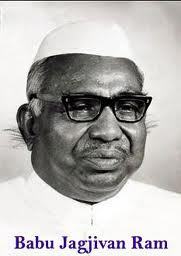 Babu Jagjivan Ram was born on 5th April 1908 in village Chandwa Distt. Bhojpur (then shahbad ) in Bihar State. His father Mahant Shri Shobhi Ram and mother Shrimati Basanti Devi were agriculture labourers & belonged to“Untouchable” caste namely Asprisya (chamar). It seems that the name Jagjivan has been drawn from the verse of Guru Ravidas “ Prabhuji Sangat Saran Tihari, Jagjivan Murari” Babu Ji , as he was affectionately addressed, by his followers was born in lowest of low castes of Hindu Religion. . Although Shudras, untouchables, or Dalits observed all Hindu Religious ceremonies on births, marriages, deaths etc, but were forced to live in poverty, & squalor without any right to complain or to come out of man made hell. However this did not deter child Jagjivan Ram to get educated & rise to the rank of Deputy Prime Minister of biggest world Democracy. Many odd circumstances of life for any Dalit during those times were difficult to sumount for child Jagjivan. However he was lucky that before his birth social war to break religious shackles of prejudice against Dalits had been started in different parts of India by saints & social reformers like Mahatma Jyotirba Phule, Mata savitribhai Phule (Father & Mother of Hindu women Education in Pune, India), Chhaterpati Sahuji Maharaj of Kohlapur, Narayan Guru, Parriyar E.V. Ramaswami, Guru Ghasidas, Gadge Ji Maharaj, Soami Daya Nanad Saraswati Ji, Raja Ram Mohan Rai, Mahatama Gandhi, Soami Viveka Nanda and many others. In 1932 at 24 years of age Babu jumped into National Movement for freedom of Harijans under Harijan Mukti Sang. Babu Jagjivan Ram came in contact of Dr. B.R. Ambedkar in 1927 .Babu Ji was uniting untouchables of Kanpur, Kanshi & Calcutta and convincing them to take part in freedom struggle. On 3rd Feb.1928 Babu Ji along with his large number of followers boycotted the Simon commission as a congress worker. Although Babu Ji was a stanch follower of Gandhi Ji, who was not compromising for the political liberation of Dalits by granting them separate electorate, as devised by British India under the Act of 1919, based on Montague –Chelmsford Report, clearly recognized the existence of untouchables & their problem for the representation in legislatures. But when Gandhi Ji started his fast unto Death on 20th September 1932, in Yaravada Central Prison Poona, where he was lodged, to get nullified what the untouchables had got through Communal Award, Babu Ji also opposed Gandhi’s move, as interests of Dalits were dear to him than any other thing. It is due to the Poona Pact signed under duress by Dr Ambedkar to save life of Mahatma Gandhi that no Dalit MLA or MP is owning their brethren . During freedom struggle Babu Ji was arrested a number of times & was jailed continuously for a long time in 1940. While addressing all India Scheduled Caste Elected Representatives from all States, along with Pt. Jawaharlal Lal Nehru at Nagpur in 1952 Babu Ji said” The rights granted by Constitution Of India to Sc/ ST and other weaker sections are being ignored &suppressed, because upper caste Hindus has not transformed their look out & mental thinking in line with changed circumstances. Hindu Samaj was sitting on a dump of explosive, which when exploded shall bring disaster. The Harijans have been brought to a situation, worst of which is perhaps impossible. To day Harijans have nothing to loose than their chains”. There after a close watch was kept on Babu Ji on the instance of Pt Jawaharlal Lal Nehru and Babu Ji was eased out of Government under KAMRAJ PLAN. Babu Ji followed principals of Guru Ravidas Ji, his Religious Guru, and started celebrations of Ravidas Jyanti. Through out his life Babu Ji worked on the ideal of Golden verse of Guru Ravidas “I wish to have a rule, where every body irrespective of his/ her caste affiliation is fed well” Babu Ji ‘s love for his poor but progressive peoples can be gauged from the following one of many such instances instance. Babu Parmanand (Ex. Governor of Haryana), during his studies at Aligarh University wrote to Babu Jagjivan Ram for financial help and got Rs 400/bymoney order which is more that Rs40000/ as per present rates. In 1933 his first wife died and he was again married second time to Inderani Devi in 1934. Babu Ji was elected member of Bihar Vidhan Parishad in 1936, and he continuously kept wining as Member of Parliament from Bihar right up to 1984, two years before his death. In 1937, 1946 & 1957he was elected unopposed. Babu Ji as a member of Constitution Drafting committee member contributed immensely during the constitution framing debates. Babu Ji adorned the high Offices of First Labour Minister, Communication Railways, Defense, Agriculture, Dy Prime Minister and he successfully brought Green Revolution (1967 ) with bumper crops, labour laws of equal pay for equal work both for men& women, Nationalization of Air Transport( 1953 ) and liberation of Bangla Desh( 1971 ). He was an able administrator and a shrewd politician. When Indira Gandhi became Prime Minister Babu Ji was given the most fearful Agriculture Ministry portfolio, as the country then was in the grip of swear draught and shortage of food grains. Babu Ji gave the slogan of Green Revolution and put pressure on traders to bring out hidden grains from their Go downs, Babu Ji’ administrative skills succeeded like success and India became food grain exporter from a food deficit country. On division in Congress party in 1969 Babu Ji acted as shield to Indira Gandhi, who nominated him as Congress President and so, succeeded in wonning Parliamentary Elections. Babu Ji never compromised for personnel gains on national issues which to his mind were detrimental to the Indian interests. He was against hero worship, but worshiper of value based principles. Nothing was dearer to him than his country and its peoples Babu Ji was against transfer of political power on the basis of family backgrounds and resisted the ways of Sanjay Gandhi . Indira Gandhi declared state Of Emergency in India which was disliked by Babu Ji and he was put under undeclared house arrest. Babu Ji resigned from Central Cabinet on 2nd February 1977 and formed a new party “Congress For democracy”, so he paved way for formation of Janta Dal Government after Emergency. Here too Babu Ji was deceived by his upper caste colleagues & his legitimate right of becoming Prime Minister was sabotaged. Although both Dr. Ambedkar & Babu Jagjivan Ram suffered stigma of Untouchability but their ways of confronting it were different. Dr. Ambedkar was radical in thinking and announced that Hinduism was immune to reforms and its ways opposed to democratic norms but Babu Ji was polite and believed that rendering financial, educational, employment support to SC/ST peoples shall loose their economic slavery bonds and pave way for breaking them. So he worked for their welfare day and night and got implemented to the extent possible, the rules framed for welfare of deprived sections of society. But both leaders never confronted with each other on this account. Dr. Ambedkar wanted to break the saddles of caste-ism by all means, whereas Babu Ji remained in the Hindu fold and tried for the upliftment of Downtrodden by effectively getting implemented the rules framed for the betterment of the Scheduled castes and other disadvantageous peoples resulting in elevating their financial status. But the radical Hindus section never changed and the statue of Sampunanand inaugurated by Babu Ji at Kanshi was subsequently washed with cow urine, and Ganga water by caste Hindus, claiming that the Stone statue was polluted by the touch of Babu Ji an untouchable. In 1968 while addressing largely attended delegation session of Depressed Classes League, at Parade Ground Jammu Babu Ji said “ Roti Aur Betti Brabri May Milti Hai , Biradri May Nahi ( bread & relations are possible between persons of in equal financial status and not in equal caste status)” This spoke volumes of the wisdom of the speaker’ mind and a guidance to all weaker sections of society to get united to fight for their rights untidily forgetting their sub caste affiliations. This public meeting was addressed among others by Pt. Trilochan Dutt, Chowdhary Guran Ditta Mal, Bhagat Chhajju Ram, Amar Shaheed Bhagat Amar Nath, then President Of J&K unit of the Bhartiya Depressed League Of India whose president was Babu Jagjivan Ram. I had the rare opportunity to meet Babu Jagjivan Ram thrice and listen to his valuable views on many problems confronting the country, the deprived section of the society, and his wise & considered views to solve these problems. After the unfortunate sudden death of his only son Suresh Kumar Babu’s heart was broken and he landed into many physical & mental problems and finally this able son of the soil breathed his last on 6th July 1986 at 10 am leaving behind his widow Inderani Devi and daughter Meera Kumar (Presently Speaker Indian Lok Sabha). His wife has also passed away. Babu Ji shall be long remembered as practical source of light & guidance for the country particularly the suppressed and deprived class of peoples. Keeping in view the life long services of Babu Jagjivan Ram, the country has decided to celebrate year long Birth Century of Babu Jagjivan Ram starting from 5th of April 2007, and the Government Of India along with State Governments have promised to start many welfare schemes for the poor and deserving section of the society. Bestowing Bharat Ratana Award, posthumously on Babu Jagjivan Ram shall be befitting tributes to the able son of India, who by his head & heart qualities rose against all odds and adorned the post Of Deputy Prime Minister of India.